This is another one of Exotica Plants great hybrids. It is between N. sibuyanensis and another fantastic hybrid N. x trusmadiensis (N. lowii X N. macrophylla). This plant should be large considering the parentage. I grow several clones of this hybrid and there does appear to be some variation within this hybrid. Some are more N. sibuyanensis influenced while others have more of the N. X trusmadiensis parentage. The peristome has definite ridging. 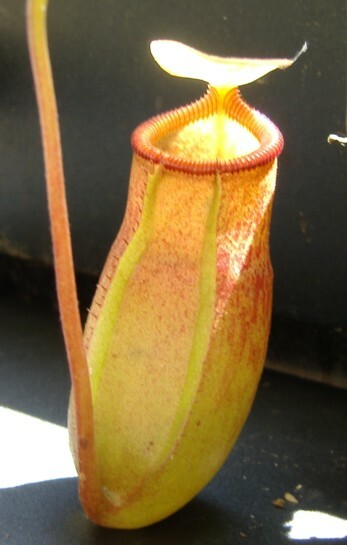 Plants have been around for several years now and larger specimens are available at times. 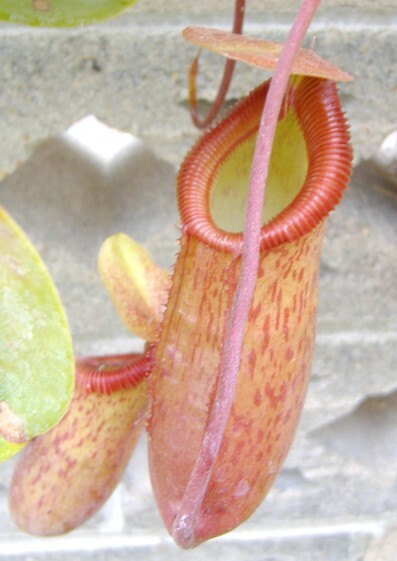 Postings in the Nepenthes forums are common of this hybrid but none of the photos I've seen appear to have the ovoid N. X trusmadiensis influence in them yet. Once the plant gets a little size it tends to grow much quicker and the resulting leaves are much larger. I grow this plant in full to filtered sunlight in hanging baskets. Some of the plants do have some basals coming off of them. I haven't seen any rooted cuttings available yet, but now that larger plants are around that may change. To me, any of the Exotica Plants hybrids involving N. X trusmadiensis are worth adding to the collection.